PanARMENIAN.Net - A month after delighting moviegoers with her "Mamma Mia! Here We Go Again" cameo, Cher entertained an entirely different audience during a sold-out concert at Atlantic City’s Borgata Hotel Casino & Spa. 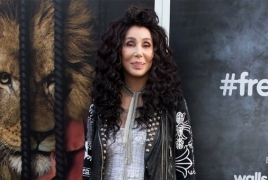 While other performers usually fill the moments between songs with forgettable patter, Cher went off-script, offering concertgoers a juicy anecdote involving her former co-star Jack Nicholson, Vanity Fair says. “Alright, sit down, because I’m going to tell you a fabulous story,” Cher teased after performing “Woman’s World,” according to The Hollywood Reporter. The next morning, still on a birthday high, she picked up a phone call from George Miller, who was casting an adaptation of "The Witches of Eastwick" starring Nicholson. Cher - who has Armenian roots - had been in conversations for the role of Alexandra Medford. And although she already had one Oscar nomination under her belt, Miller said that he and Nicholson did not think Cher was right for the part. As Cher remembers it, Miller was not done with his insults. “He just wanted to tell me everything: ‘I hate the way you walk. I hate the way you talk. I don’t like the color of your hair. I don’t like your eyes,’” Cher recalled. Cher’s rebuttal worked and she was cast in The Witches of Eastwick alongside Nicholson, Michelle Pfeiffer, and Susan Sarandon. And you know what? Cher and Nicholson actually became friends.